Transit Shelter in Uptown Saint John, NB transformed overnight into a Park Retreat for Tourism New Brunswick. 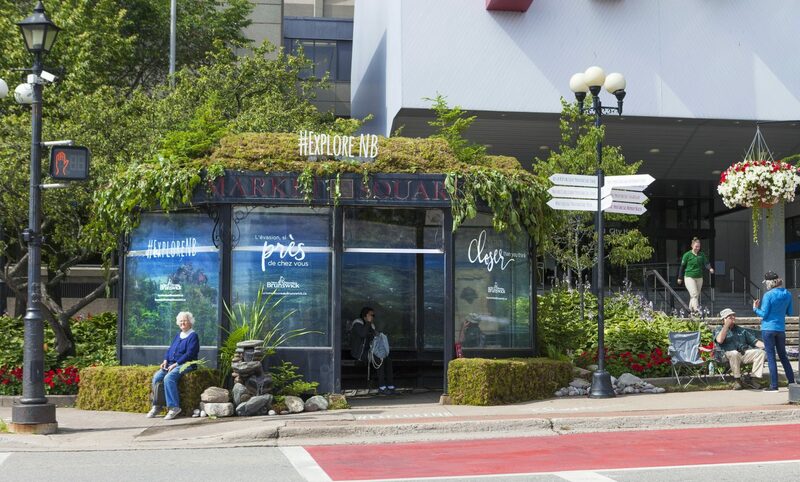 Working with the City, PATTISON Outdoor secured the location and city approvals for the innovative execution at the Market Square in Uptown Saint John. Wavelight Productions and Shannon Multimedia Productions were involved in the recreation of the Shelter, as well as in producing and filming a video for Tourism New Brunswick’s online campaign. This execution included scenic vinyl adhered to the shelter, custom landscaping, park guides and a sign to bring awareness to the nine Provincial Parks throughout New Brunswick. The online video was pushed out through digital and social media channels and has amassed over 150,000 views to date. “Using the element of surprise, the Department of Tourism, Heritage and Culture’s marketing branch wanted to create a fun and shareable video to build awareness of Provincial Parks as part of a New Brunswick based advertising campaign. The intent of the campaign, ‘Getting Away is Closer Than You Think,’ is to demonstrate to New Brunswick residents all of the experiences available so close to home,” says Jennifer Kenny, Senior Director of Client Service, New Brunswick of m5 Marketing Communications. “We needed a busy street location and a bus stop space that was ideal for transformation as well as for filming. This bus stop fit all criteria.” The New Brunswick campaign included fully-wrapped transit shelter locations in Moncton, Fredericton and Saint John and was paired with TV, radio and digital advertising throughout the province. PATTISON Outdoor is a full service Out-of-Home media company, providing end-to-end campaign support, including planning, management, creative services, production and 24/7 network monitoring. PATTISON Outdoor Advertising, a division of The Jim Pattison Group, is Canada’s largest Out-of-Home advertising company. With its roots reaching back to 1908, PATTISON has been providing innovative solutions for Out-of-Home advertising opportunities with products ranging from traditional billboards and posters to transit, digital, airports, mall, residential, office, and street furniture. PATTISON also offers Canada’s largest portfolio of Digital Out-of-Home (DOOH) advertising properties, through PATTISON Onestop, a world-leader in the design, operation, and advancement of digital advertising networks for the office, transportation, sports retail, and residential environments, and with its experiential/interactive development arm at Fourth Wall. PATTISON is headquartered in Toronto, Ontario and includes over 25 sales offices across the country providing advertisers unmatched reach and coverage with products available in nearly 300 markets coast to coast. PATTISON Outdoor Advertising is the exclusive supplier for advertising on the Toronto Transit Commission’s (TTC) transit system.